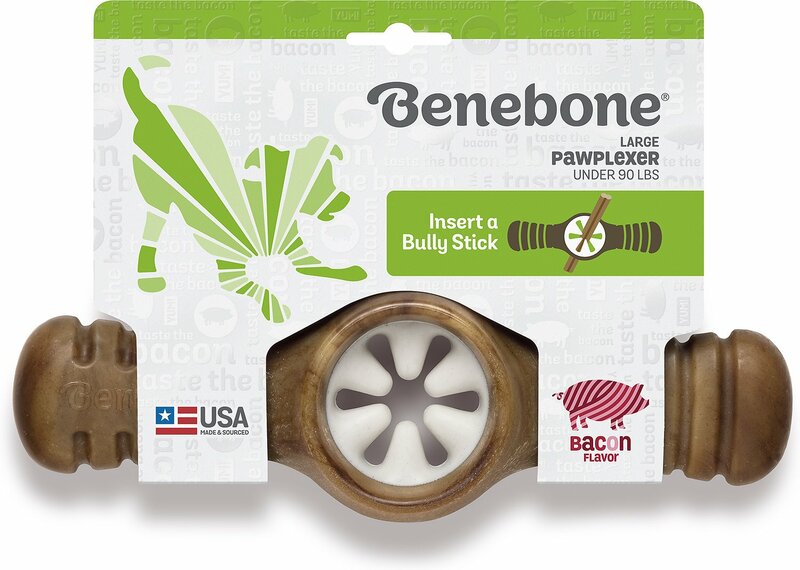 Return the flavor to your best friend with a Benebone Pawplexer Bacon Flavored Dog Chew Toy. Inspired by your canine companion’s powerful sense of smell and instinctive urge to chew, this long-lasting, durable toy is jam-packed with the flavor of 100% natural, U.S.-sourced bacon. The highly versatile Pawplexer is like having two toys in one–it’s an irresistible chew all on its own, while the unique, rubberized center allows you to add a tasty bully stick, jerky strip or your choice of treat for added fun and creativity. Designed for hours of interactive entertainment and mental stimulation, the ridges and varied shapes of the toy also help maintain good dental health by scraping away plaque and tartar as he happily gnaws away. 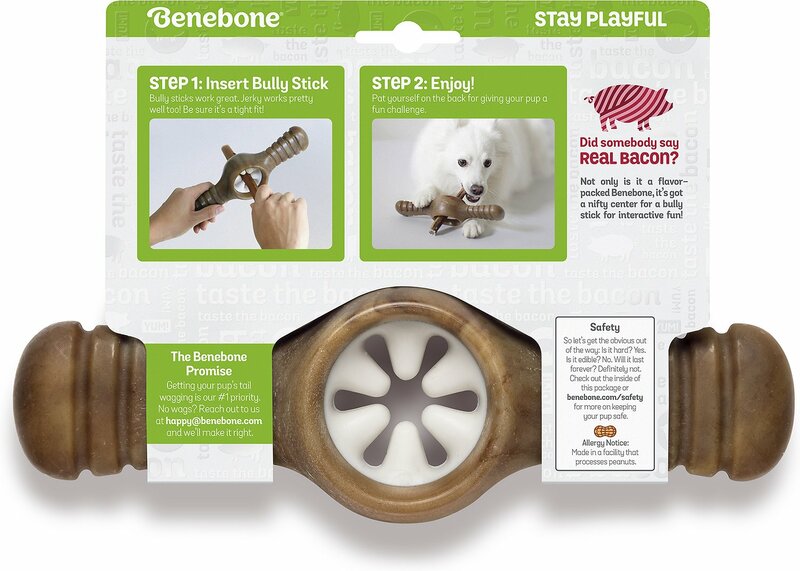 Super-strong, durable nylon chew is infused with 100% real, U.S.-sourced bacon; contains no chemicals or preservatives. Two toys in one–an irresistible chew by itself that can also hold a bully stick or other treat in its rubberized center. Unique ridges and contours scrape away plaque and tartar as he chews to help maintain good dental health between brushings. Proudly designed and manufactured in New York using only high-quality, U.S.-sourced materials and ingredients. Small size is recommended for dogs up to 40 pounds, while the large size is recommended for dogs up to 80 pounds. Food Grade Nylon and Bacon. Watch for wear and replace Benebones frequently to ensure that the product remains whole and intact at all times. Though a rough guide only, Benebones should be discarded if a piece larger than a grain of rice has broken off or may break off. As a general rule, if the product has lost more than one cubic centimeter of volume (the size of a sugar cube) it is time to replace the product. After aggressive chewing, the product can become bristled and sharp. Monitor the condition of the Benebone closely to watch for bristles or sharp edges. The product can be smoothed with a wood file or heavy grit sandpaper. Always choose the largest product your dog can handle, even if you have a dog rated for the smaller size. Heavy chewers are encouraged to use the larger products as it is the strongest, thickest product. My dog is allergic to certain foods, am I safe to give my dog a Benebone? Benebones are made of nylon and are made in facilities that process peanuts, tree nuts, chicken, pork and beef. In addition, Benebones may contain peanuts, tree nuts, chicken, beef, peppermint and/or maple wood ingredients for flavoring purposes. Therefore, Benebones should not be purchased for use in households where a human or pet may have an allergy to nylon, peanuts, pork, chicken, peppermint and/or maple wood. I have two American Staffordshire terriers and they are super chewers like many of their breed. Seems to help get that energy out they need with chewing and with something that is durable. Nothing has broken off as far as pieces are concerned. they have not hurt their mouths with it and if anything their teeth are much cleaner because of it. I really haven't stuck anything in the middle because they seem to be enjoying the chew toy without having an extra bone inside of it. I do make sure to supervise them when they using it but it's a hit in our house. Benebone got such great reviews that I ordered 3 different types for my 3 voracious chewing dogs. After about 3 weeks the Benebone's are virtually untouched. My 2 1/2 year old male vizsla loved the bone at first but lost interest after his first hour long chewing session. It is also really hard to get treats into the center. My dogs love these chews; especially the bacon flavor!!! I have two pitbulls who are very aggressive chewers and this toy has survived weeks of play. It is actually the the third kind of benebones that we have ordered and all are equally as durable. This design is actually perfect for the two of them to chew/hold on to at the same time! My two 80# plus rescues love this one. They take turns chewing, as they do with all their Benebones. These are the best. Mine have learned they are allowed to chew these, and seek them out if bored or stressed. My pup is a power chewer and typically loves Benebone toys. This one just doesn't seem to interest her. I think it's the shape that is less appealing to her. I do try to keep her interested by shoving baby carrots in the center, but this doesn't keep her busy for long. Baer loves spending time with me relaxing and chewing on his benebone. It's even better when a chew stick is with it! It is a very very hard "toy". I cannot chew it, so I don't know if there is Bacon flavored. My 94 Lbs male Doberman seems not really enjoy it. Also it is so hard that makes very noisy on my hard floor.